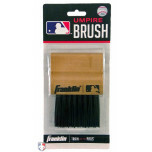 The most popular umpire brushes for cleaning the plate are the wooden and plastic handle brushes. The wooden is a more traditional look and is more durable while the plastic fits in your back pocket better and is easier to pull out if from there. 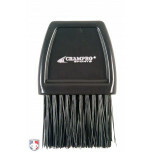 Consider 3-in-1 umpire brushes (also measures bat diameter) that serve multiple roles including scraper for heavier duty or for mud. 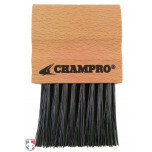 Keep multiple types of each umpire brush in your bag to use based on condition or preference. 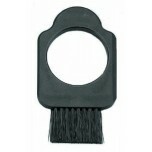 For more details, read the Umpire Plate Brushes Buying Guide. Fits great in my pouch of my ball bag. Seems to work nicely. 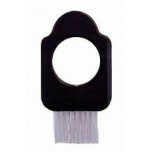 Solid plate brush, easy to use. Can't comment on durability yet, but I love how thin this thing is. Fits perfectly in the back pocket and easy to take out compared to the wooden one I used to use.